The impact of environmental damage from dredging on the tourism industry, recreational fishing and commercial fishing including the release of potentially contaminated sediment into the greater Trinity environment and its impact on both human and wildlife health. Impacts on critical habitats including seagrass beds and coral reefs. In late 2013, the Federal Environment Minister Greg Hunt approved dredging of three million cubic metres of sediment as part of the coal port expansion at Abbot Point. Additionally, in a recent decision by the Great Barrier Marine Park Authority, approval has been given to dump the dredge spoil in the Great Barrier Reef (GBR). 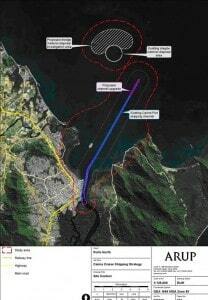 This decision has led to public outcry and a high level of opposition to the Abbot Point approval and the proposed Trinity Inlet Cairns Shipping Development Project, as shown in media and by the following. A recent rally at Port Douglas to “Save the Great Barrier Reef”, which raised awareness and demonstrated community opposition to dredging proposals along the GBR coast. Particular concern was expressed about the proposed expansion of Trinity Inlet. The results of a CAFNEC run survey showing that an overwhelming 95% of respondents were concerned about the dredging and dumping proposal for Trinity Inlet. A planned community gathering and march on the Cairns Esplanade April 6th which will express concern about the Trinity Inlet proposal. The expanded Trinity Inlet channel would also require twice the amount of maintenance dredging as currently occurs – an impact that would occur year after year and tip over the edge an environment already struggling to deal with a range of human impacts. We only need look to Gladstone Harbour for indications of what might happen in the Far North. What happened when they dredged in Gladstone? In 2011 the Gladstone Ports Corporation commenced their Western Basin Dredging and Disposal Project in the Port of Gladstone. Serious problems occurred including outbreak of diseased fish in the harbour and health problems in over 40 fishermen after contact with the water. Fishermen believed the outbreak was caused by contaminants released into the water by dredging activities. The Great Barrier Reef Marine Park Authority’s Draft “GBR Region Strategic Assessment” was released for public consultation late last year. The assessment showed that despite some small areas of improvement, reef health is poor and in decline. The extent of coastal and port development and approvals contributed to a decision by the United Nations Educational, Scientific and Cultural Organisation’s (UNESCO) World Heritage Committee to undertake a Reactive Monitoring Mission. In its Mission Report in June 2012, UNESCO stated “…the future conservation of the Great Barrier Reef World Heritage Area (GBRWHA) is at crossroads and decisions that will be taken in the immediate future will be decisive for the long-term health of the property as a whole”. The mission concluded that immediate action is required to secure the GBRWHA’s Outstanding Universal Value (OUV) in light of current and future threats, with the most important of these – climate change, catchment runoff, coastal development, ports and shipping and direct extractive use. With reference to the rapid increase of coastal developments, including ports infrastructure, the mission expressed high concern for the conservation of OUVs stating that “The mission considers that the property does not currently meet the requirements for inscription on the List of World Heritage in Danger, but risks meeting those requirements if remedial measures are not undertaken.” In one of the recommendations, it is requested that no developments be permitted that may create individual, cumulative or combined impacts on the OUV of the Great Barrier Reef World Heritage area and its long-term conservation.